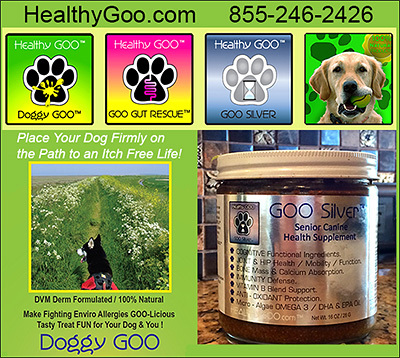 GOO Silver by Healthy Goo gives your dog the Ultimate Health Support as your dog ages! You'll be amazed at the difference and your dog will love the way he or she feels! Every Dog Can Greatly Benefit From The “GOO”! Healthy GOO, with it’s Senior Varsity / Broad-Spectrum Canine Supplement GOO Silver believes that the Body needs to be Nourished on a Cellular Level, to maintain a Healthy Homeostasis and that a Supplement Therapy can be an Important Part of an Animals overall Pre-Emptive / Preventative Health Strategy toward the pursuit of Full Life Wellness. Are You Looking for a Solution To The Misery Of Seeing Your Beloved Dog Grow Older? As your dog ages, his or her ability to cope with the rigors of life and ability to fight off infection, naturally weaken. The makers of GOO Silver know that while aging can’t be stopped, many of the negative effects of aging can be greatly eased. Why not give your older dog the best health support possible. GOO Silver is a spreadable, peanut butter- based “goo” that contains a vast array of nutritional support that can make a real difference in the way your dog feels! NOTE: If your Dog suffers from the itching, biting and scratching associated with allergies, please give DoggyGoo a try. What Should I Give My Younger Dogs Or Dogs with Allergies?-- Try Doggy GOO ! Doggy GOO  leverages natural adaptive power of Immune System methodology to help build and strengthen your dog's immune system tolerance to 10 pollen, 3 mold, 2 mite and 2 food allergy sources. Doggy GOO’s beneficial yeast ingredients work to support and balance your dog's first line immune defenses. The Prebiotic & Probiotics support healthy gut functionality and nutrient absorption. Doggy GOO  can help allergy stressed dogs reestablish immune tolerance to environmental allergy sources. Doggy GOO  can preemptively build immune tolerance to environmental allergy sources in your puppy. Why is Doggy GOO  Important? Any dog can suffer from allergies but research has shown that may of the most popular breeds including Scottish Terriers, West Highland White Terriers, Cairn Terriers, Wire Haired Fox Terriers, Pugs, Miniature Schnauzers and English Bulldogs, Lhasa Apsos, English Setters, Irish Setter, Retrievers and Dalmatians are genetically predisposed to allergies. A premium Canine Immune System Health Supplement focused on promoting the Health & Response of your Dog’s Immune System. Simultaneously Targets, Supports & Balances the Innate, Acquired & GUT Tiers of your Dog’s Immune System. Doggy GOO’s methodology builds Immune Tolerance to everyday Environmental Allergy Sources. WHY Doggy GOO  For My Puppy or Dog ? For PUPPIES or Young Dogs ( Pre 9 mo. ), Doggy GOO Pre-Emptively builds Immune Tolerance to Enviro Allergens before Allergy has a chance to become entrenched. For “Allergy / Atopic Dermatitis Stressed “ Dogs, Doggy GOO Re-Establishes / Builds / Maintains Immune Tolerance to Enviro Allergens. How Do I Feed DoggyGoo? What Do People SAY About DoggyGoo? Until I tried Doggy GOO, She would get terribly Itchy and Bumpy especially in the Warmer Weather. Now, she's good to GOo. No more Skin Issues. I figured it couldn't hurt so I started to give it to him as well. He is doing so much better now. I don't know how or why, but he can breathe without any problem now. This morning, I ordered my 3rd jar of Goo!! After the first week of Doggy GOO, I gave my Dog / Orion his monthly dose of Heart Worm medication. He broke out 5 days later, first on his leg and then his chest, with raised itchy lesions. The Doggy GOO lessened the severity and duration of this outbreak and now, a week later, the allergic reaction has subsided. We are now on our second jar of GOO, and he is Happy, Healthy and full of Energy, as he should be. Prior to GOO, he scratched, licked and bit constantly - what a Relief to now be GOO Well ! I am purchasing my 3rd Jar of Doggy GOO and I am truly Amazed at how much GOO has Helped with Me and Cooper. I just took him to the Vet for his Yearly Check-Up and he received an A+. The Vet said his Skin and Paws looked Great. Since GOO, I've not had to buy any Medicine, No Steroids or Bi-Weekly Trips to the Vet. Had I not been Desperate, I may not have tried Doggy GOO because it did Sound “To Good to be True”, but in my Case..... GOO IS THAT GOOd !!! Put Your Dog On “Goo” and See The Goo-Difference! Don’t spend thousands when there is a Goo-reat Solution that is so much more affordable and effective. Call us today and order your “goo”. A 16 oz container (please refrigerate upon opening) is only $73.45 and can last up to 90 days for small dogs or up to 30 days for large breeds (we’ll help you get the right dosage). This is so much more affordable (and delicious!) than hundreds spent every month at the vet for products that really don’t work or are even harmful to your pet’s health (like steroids!). Call us today and tell us about YOUR dog!